As you probably saw in an earlier post, I was the last few weeks in Cape Canaveral and got to witness the launch of a SpaceX Falcon 9 rocket. More about that in another post. For parts of the time, I stayed at the Four Points Cocoa Beach. It’s December and it’s busy season here for the hotels. The Four Points was pretty booked for the upcoming weeks, but I was able to get a full week stay out of it. Mostly cruise passengers were booking the rooms here and also some snowbirds. The hotel shares the building with the Cocoa Beach Surf Company. A big store with all kind of stuff you need for the beach and beyond. They also offer surf lessons and beach rentals of all kinds, including Surfboards, Body Boards, Beach chairs, Beach Umbrellas, you name it. The check-in was easy peasy. Shannon checked me in and had a pleasant surprise for me. She comped the daily parking fee of $6. But I think they pretty much did that for everyone. I got my keys and headed out to the car. 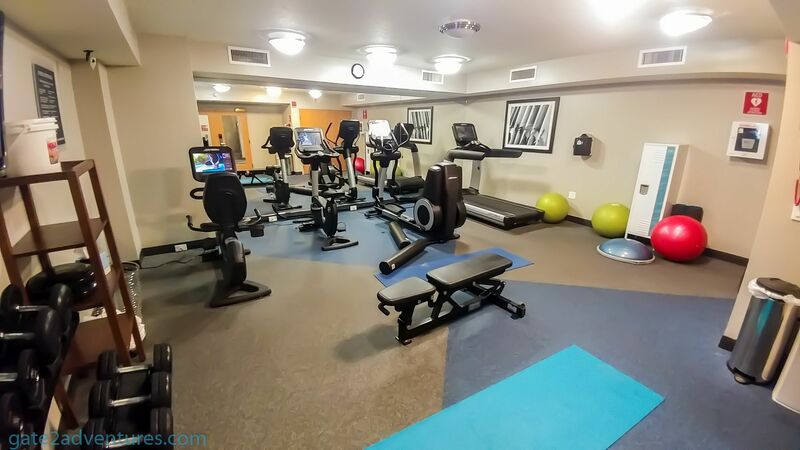 The parking garage was right next to the hotel and you were able to access the hotel directly from the parking garage at certain floors. Even tho that I got invited to leave my car parked outside at the 10-minute parking for check-in to drop my bags in the room, I thought I can drive up to the parking garage and my floor had also straight garage access. Well, that was a mistake. The architect of this place messed up big time. Yes, you can access the hotel straight from the parking garage however you have to go about 4 stair steps down to get on the actual hotel floor. So if you have bags in tow, this is a very great surprise for one. So I lifted the two bags down one at a time. Once there you will get to the elevator lobby of that floor. Now you need your room key to open the door actually leading to the guest rooms. I grabbed my two bags after unlocking the door and headed down to my room. As SPG Platinum I got upgraded to a suite. The suite was very well spaced with a lot of room to enjoy the stay. The only downside was, that I had an inside view of the store, which is located in the same building as the hotel. There was no way to see outside and you didn’t know if it was day or night. This was the only setback. As I was here for work, it didn’t bother me too much, but if you are here for vacation I bet you would like to see the sun. As you walk into the room, the bathroom was first on the right side followed by two queen beds on the right as well. On the adjacent wall are a wall-mounted TV and a long work desk right below it. Perfect for me to get some business done. A little further down the room, past the beds, is a small wall going about halfway into the room from the right. This separates the “living area” from the bedroom. You can find the sofabed and a living room chair. This is the end of the room and has a few of the inside of the store. Which was kinda cool for the first 5 minutes but after that, I rather had a window facing outside. Ask for a room with an even number to get an outside view. But it looks like, if you book a suite you will be facing inwards. 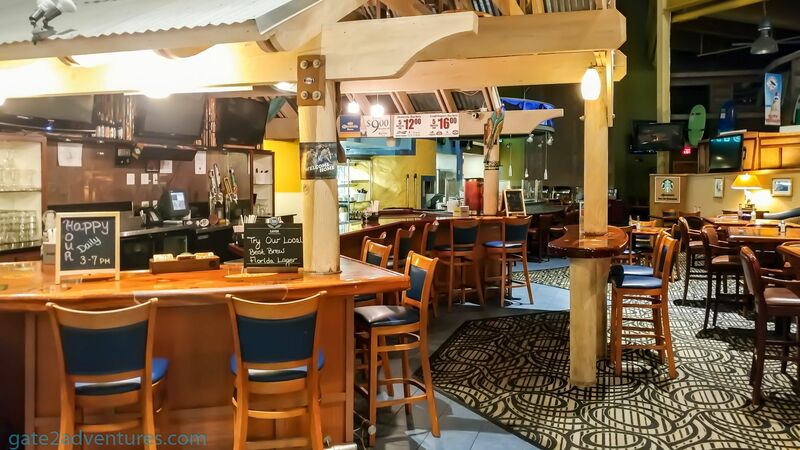 The lobby on the ground floor leads over to the Cocoa Beach Surf Company store which also has multiple floors but is only connected through the ground floor to the hotel. In the lobby, you can find freshly brewed coffee in the morning. There is a small business center with 2 PC’s on the second floor. There are a small table and gathering space as well and both have a view of the lobby. 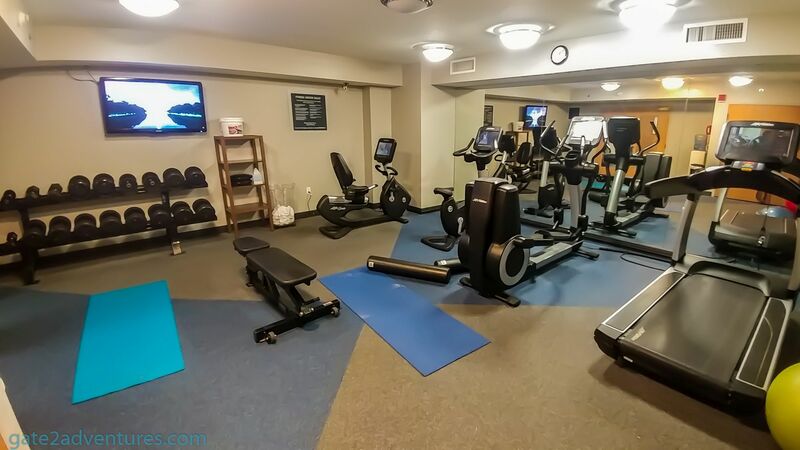 The fitness center is also located upstairs and is well equipped for a good workout. The beach is only 2 blocks down the street and you can walk there easily. There is also a small parking lot in front of the beach, but you will get charged to park there. So just walk the few steps if you don’t have too much to carry. The Hotel Pool is located on the ground level of the parking garage. Besides the heated pool, there is a whirlpool and a waterfall. Between the Shark Pit Bar and Grill and the Surf shop is a 5600 gallon Shark Aquarium. Yes, there is a real shark in there besides exotic fish. You can watch the feeding every Tuesday and Saturday. There are two options for dining. During the week your best bet for breakfast is Starbucks, which is located inside the same building just past the Shark Pit Bar & Grill. Starbucks is open every day from 6 a.m. until 6 p.m. 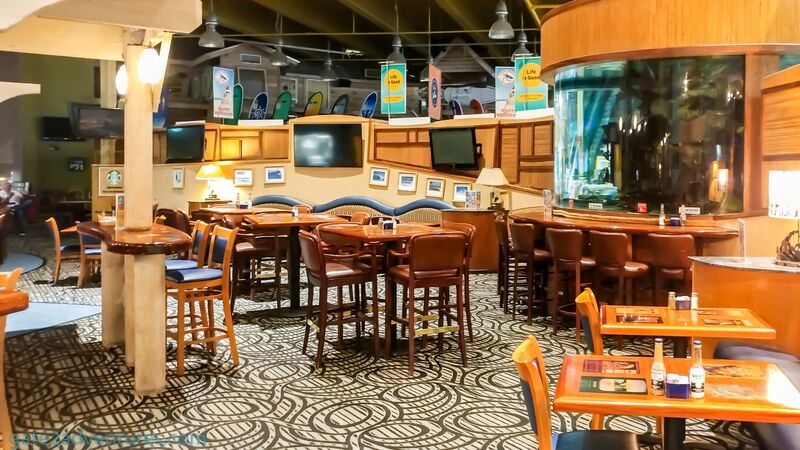 The Shark Pit Bar & Grill is open during the week from 11 a.m. until 11 p.m. and serves American cuisine. Their special is a hand-tossed pizza cooked before your eyes in their open face pizza oven. On the weekends (Saturday and Sunday) the Shark Pit Bar & Grill serves an all American breakfast buffet open from 7 a.m. until 11 a.m. Check their website for more info. Another alternative is to order room service. 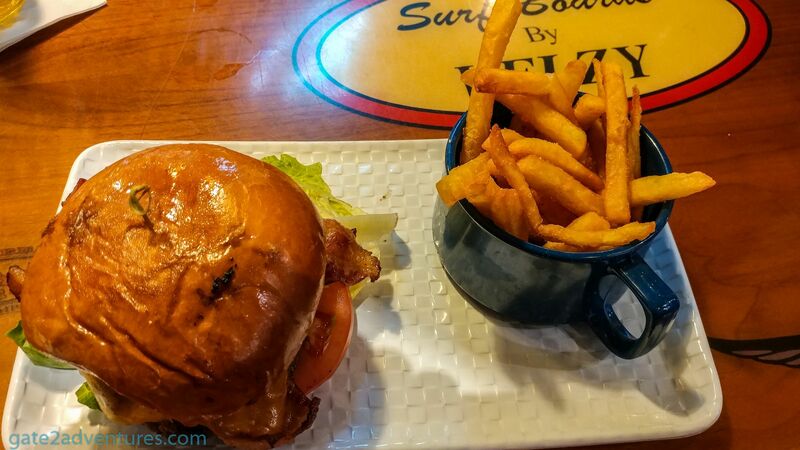 Of course, there are plenty of dining options close by and only a short walk away. Definitely a nice hotel with clean rooms. Staff was friendly and took care of their guests. As I mentioned earlier if you don’t need a suite, get a room with an outside view rather than a few of the inside of the store. The view outside is not the best, but I would prefer it. Another small downside is that you have to use your room key at every level to enter the guest room areas and again for your actual room. This is supposed to keep the surf shop visitors out from the hotel area but adds an extra small inconvenience for the hotel guest. Great if you are just staying here the night before your cruise or actually visiting Cocoa Beach and the surrounding areas. A piece of small advice, Ron Jon Surf Shop is open 24 hours a day and houses the Florida Surf Museum. You might want to check it out, as it is right next door. Daily from 11 a.m. – 11 p.m.
Breakfast Buffet Saturday and Sunday: 7 a.m. 11 a.m.